This is a version of a paper I presented at the International Medieval Congress at Leeds on July 3, 2018, in the session “The Origins, Effects, and Memory of Caroline Minuscule, II” sponsored by the Network for the Study of Caroline Minuscule. 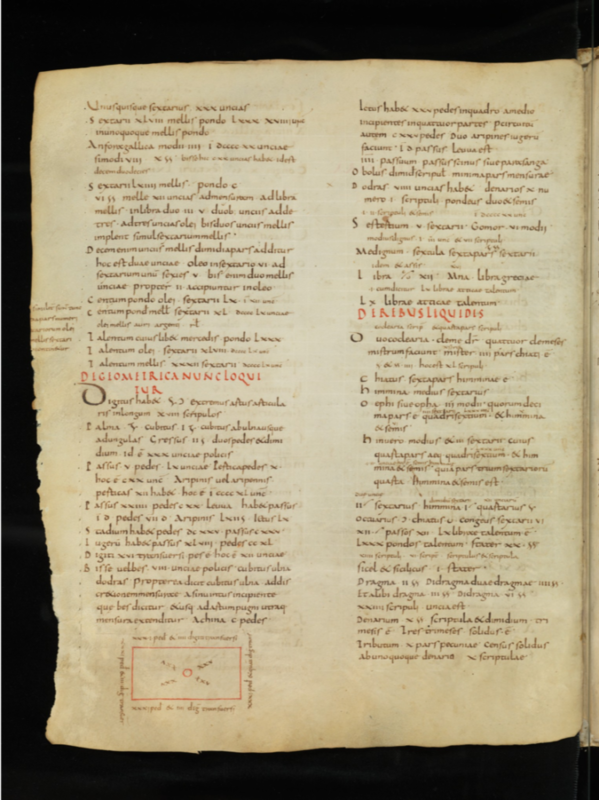 Today I’m going to tell you about UPenn LJS 101, which is the oldest codex we have in the University of Pennsylvania Libraries by at least 150 years and which is one of only two codices in our collection which is written in Caroline minuscule (the other one being UPenn Ms. Codex 1058, dated to ca. 1100 and located to Laon) – we also have one leaf written in Caroline minuscule. 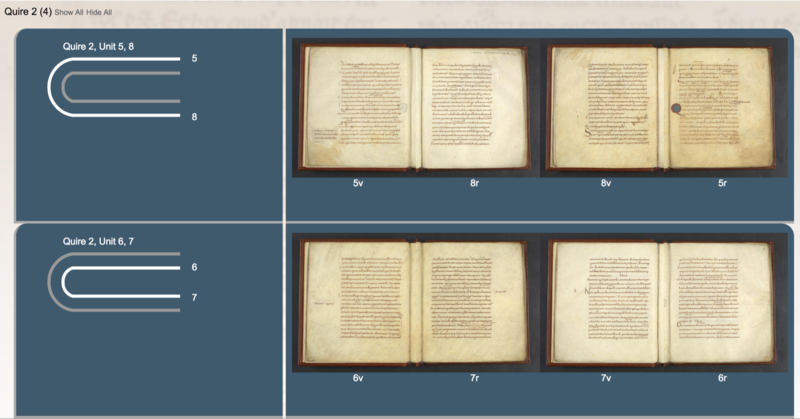 The bulk of the manuscript, folios five through 44 (Quires two through six), are dated to the mid-9th century, but in the early 12th century replacement leaves were added for the first four leaves and for the last 20 leaves. LJS 101 reflects the educational program set up in the Carolingian court by Alcuin, featuring a copy of Boethius’s translation of Aristotle’s De Institutiatione (which was commonly called Periermenias, the name also used in this text) and a short commentary on that text (also called Periermenias), along with a few other shorter texts. 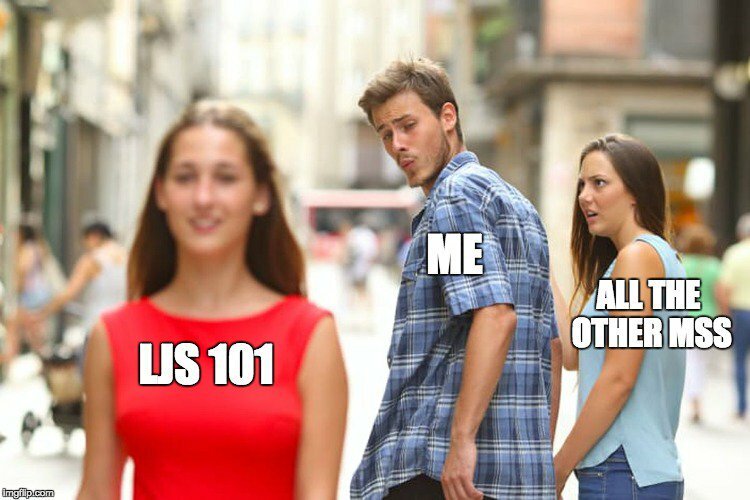 I want to admit up front that I don’t have a serious scholarly interest in LJS 101. I’m not a Carolingianist, I don’t study Alcuin, or Bede, or Aristotle. 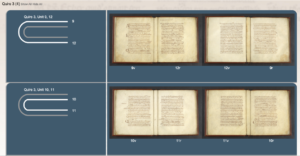 I’m a librarian, and the focus of my work is manuscript digitization and visualization, so I spend a lot of time thinking about manuscripts, how they’re put together, how to digitize them, and how to visualize them in ways that reveal truths about the physical object, ideally without fetishizing them. But I also love manuscripts. I wouldn’t be doing what I do if I didn’t. I love the way they look, especially books that have been well-used: the imperfect edges, worn ink, and the many and varied signs that people have had their hands on these manuscripts, that they were well-used and well-loved. And there’s no book I love more than LJS 101. So what I want to do today is tell you about LJS 101, but I want to put my discussion within the context of that love, specifically I want to talk about LJS 101 within the frame of Transformative works. Transformative works are creative works about characters or settings created by fans of the original work, rather than by the original creators. Transformative works include but are not limited to fanfiction, real person fiction, fan vids, and graphics. A transformative use is one that, in the words of the U.S. Supreme Court, adds something new, with a further purpose or different character, altering the [source] with new expression, meaning, or message. In some fandom communities, transformative works play a major role in how the members of that fandom communicate with each other and how they interact with the canon material (“canon” being the term fans use to refer the original work). Transformative works start with canon but then transform it in various ways to create new work – new stories, new art, new ideas, possible directions for canon to take in the future, directions canon would never take but which are fun or interesting to consider. Although it’s still quite niche there is a small but growing academic movement to apply the concept of transformative work to historical texts. Some of this work is happening through the Organization for Transformative Works, which among other things hosts Archive of our Own, a major site for fans to public their fanworks, and provides legal advocacy for creators of fanworks. The Organization for Transformative Works also publishes a journal, Transformative Works and Cultures, and in 2016 they published an issue “The Classical Canon and/as Transformative Work,” which focused on relating ancient historical and literary texts to the concept of fan fiction (that is, stories that fans write that feature characters and situations from canon). There is also a call for papers currently open for an upcoming special journal issue on “Fan Fiction and Ancient Scribal Culture,” which will “explore the potential of fan fiction as an interpretative model to study ancient religious texts.” This special issue is being edited by a group of scholars who lead the “Fan Fiction and Ancient Scribal Cultures” working group in the European Association of Biblical Studies, which organized a conference on the topic in 2016. Closer to home, Dr. Juliana Dresvina at Oxford University is organizing a colloquium later this month on “Fanfiction and the Pre-Modern World,” and I understand she is planning to organize a larger conference next year. Back to LJS 101. What I want to do here is look at LJS 101, not as a piece of data to be mined for its texts, but both as a transformative work in itself, and as an object for the transformative work of others, particularly digital versions, and I want to center this looking at the manuscript using a language of care. I’m not comfortable applying the concept of affective reception to the people who created and worked with LJS 101 over the past 1100 or so years – I don’t want to suggest that the person who took the manuscript from its original form to its 12th century form loved the manuscript the same way that I do – but I do want to explore the idea that this person or people cared about it, and that other people have cared about this manuscript over time enough that it survives to live now in the library at the University of Pennsylvania. Their interests may have been scholarly, or based on pride of ownership, or even based on curiosity, but whatever their reasons for caring for the manuscript, they did care, and we know they cared because of the physical marks that they have left on this book. The manuscript as it survives also shows some examples of lack of care, and I want to address those as well. 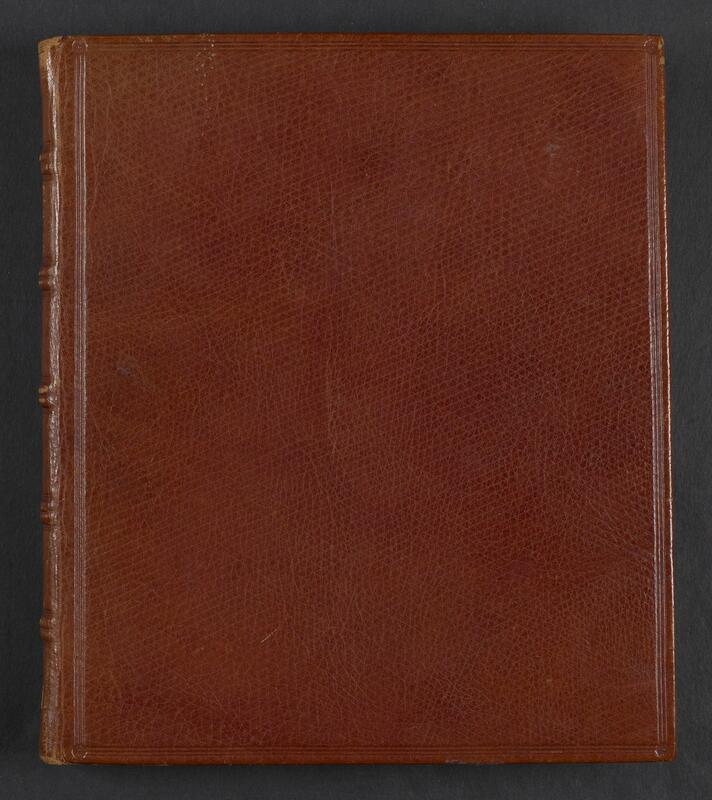 Binding: 19th-century English diced Russia leather, bound for Sir Thomas Phillips. The first obvious mark of care on LJS 101 is the binding, which is a lovely 19th century leather binding done for book collector Sir Thomas Phillips, who purchased the book in or around 1826, and which was sold out of his estate in 1945, sold again in 1978 and 1979, and finally sold to Lawrence J. Schoenberg in 1997. Formerly owned by Sir Thomas Phillips, ms. 2179 (stamped crest inside upper cover). LJS collection bookplate. Gift of Barbara Brizdle Schoenberg in honor of Amy Gutmann, President, University of Pennsylvania, 2014. 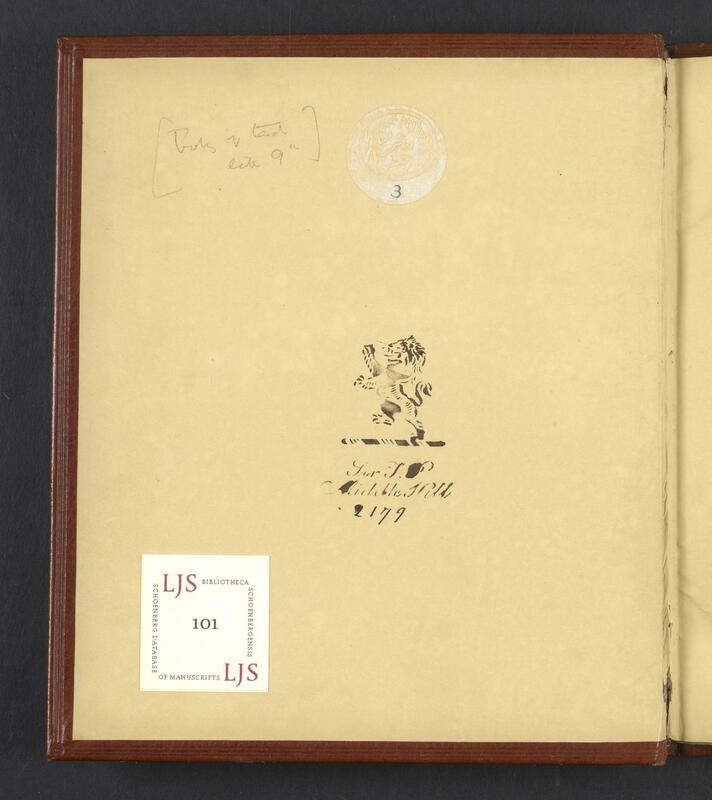 Phillips also left two owners marks on the inside front cover, a stamped crest in the upper part of the inside cover, and a second ownership stamp with his library’s number for the manuscript (ms. 2179). Another ownership mark is the Penn Libraries bookplate, showing that the manuscript belongs with the Lawrence J. Schoenberg collection. Phillips and Schoenberg both cared: Phillips cared enough to bind the book, they both marked it as their own, and Schoenberg gifted it to Penn in 2014 for long-term institutional care. 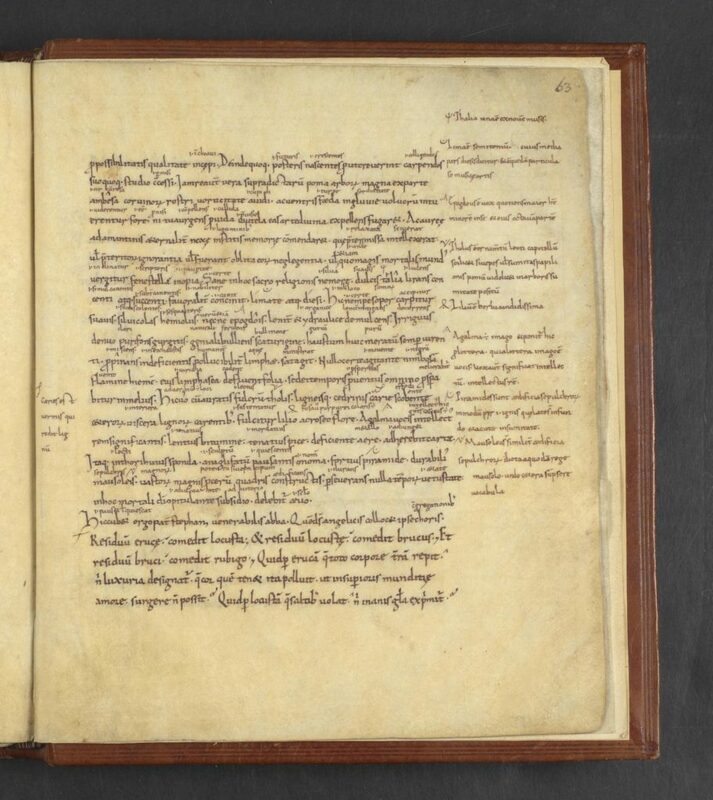 The main text of the manuscript, the Latin translation of Aristotle’s De Institutione (called Periermenias Aristotelis generally and in the text), begins on fol. 1v. Boethius’s translation of De Institutione, along with his translation of the Categories and Porphyry’s introduction to Aristotelian logic, the Isagoge, formed the core of Alcuin of York’s logic textbook, De dialectica. These three works—as translated by Boethius—would become known as the logica vetus, and would dominate the study of logic until the twelfth century. This explains the why of this manuscript – this was an important text. The inclusion of the now-missing grammatical text also implies that this book was designed with care to be a sort of textbook. Note the striking illuminated initial P that begins the text – a visual sign of care taken in the design of this manuscript. Folio 4v-5r, with the 12th century script on the left and the 9th century script on the right. 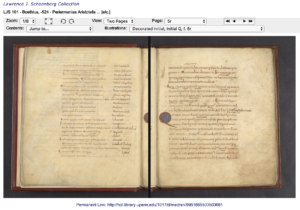 As noted above, the 12th century text from Quire 1, folio 4v, continues directly to the 9th century portion of the manuscript on Quire 2, folio 5r. 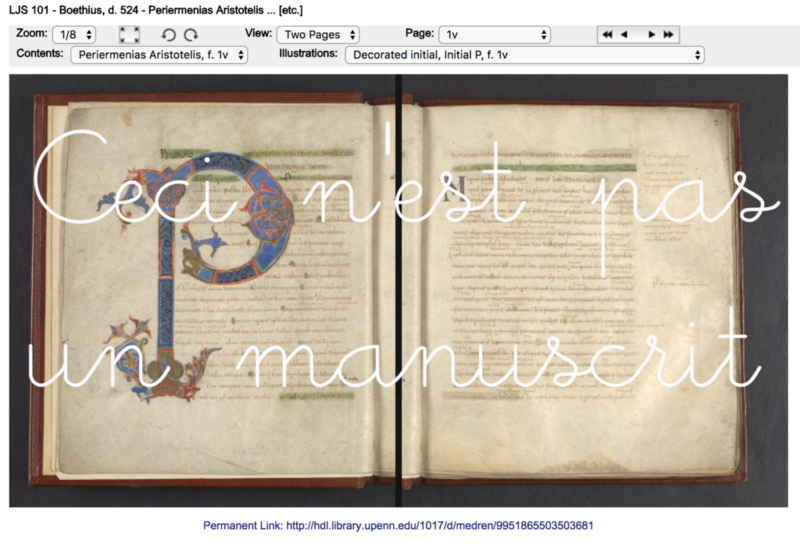 UPenn LJS 101, folio 27r, showing interlinear and marginal corrections and glosses. The same hand that wrote out the 12th century full text here and from folio 45 through the end of the manuscript also went through the 9th century text and made many corrections, both deleting and adding text. 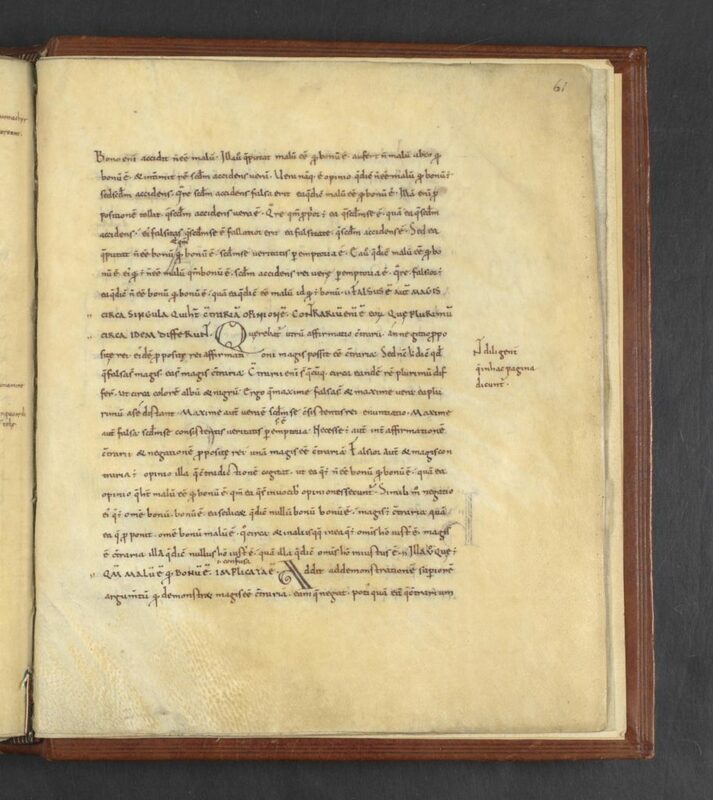 As far as I know there hasn’t been a full textual analysis of the text in this manuscript, but it’s possible, if not likely, that the 12th century scribe had a more recent copy of the text and corrected the older version in comparison with it. 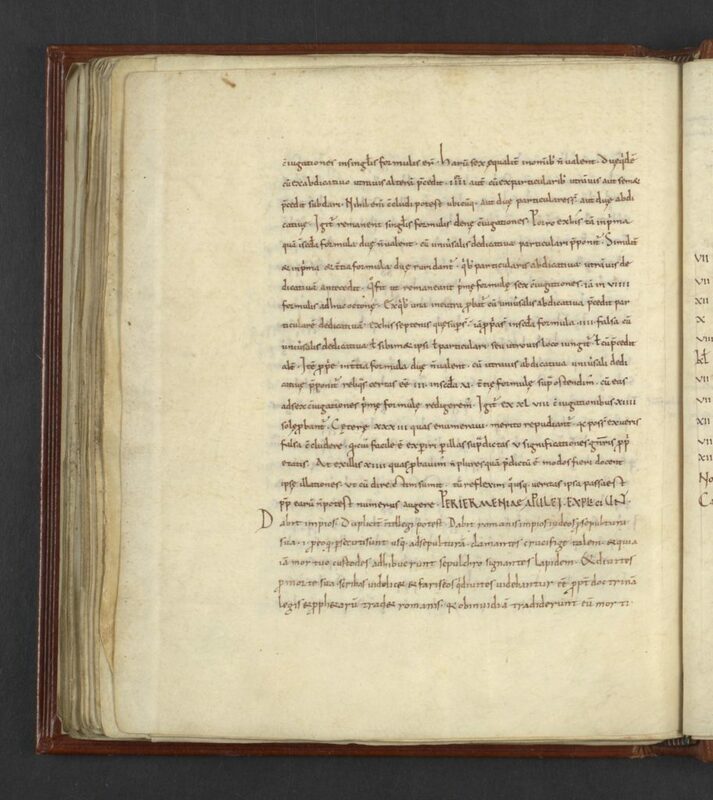 For whatever reason the scribe, or someone supervising the scribe, cared enough to take the existing 9th century copy of Boethius, to complete it, and to bring it up to date with an improved version of the text. Also in the 12th century program of care, the scribe or someone alongside the scribe added green and yellow highlighting to the 9th century diagrams and to some of the headwords. 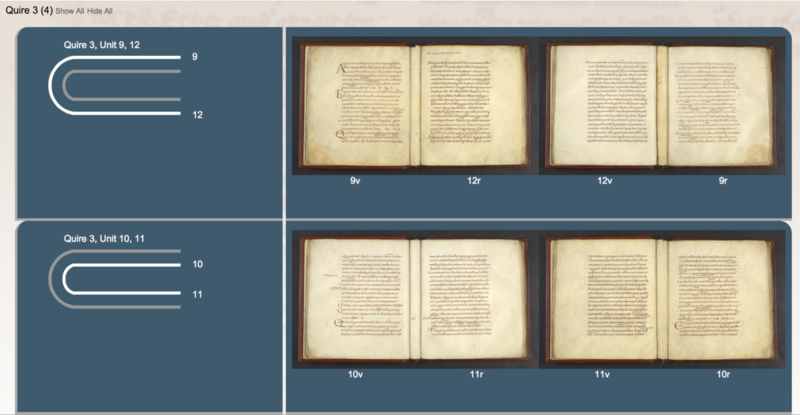 As we move on though the manuscript, note that the number of corrections drops precipitously after folio 45, when we are back with the 12th century scribe. LJS 101, folios 52v-53r; there are several leaves missing here. 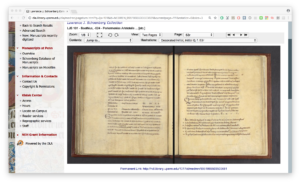 There are several quires’ worth of leaves missing between Quire six (ending with folio 44) and Quire seven (beginning with folio 45, where the manuscript switches again from 9th century to 12th century) – 49 pages worth of edited text, from Prima Editio, I c. 9, p. 111 line 20 to Prima Editio, II c. 11, p. 160 line 15– and there are at least two quires missing between Quire seven (folio 52) and Quire eight ( folio 53), from Prima Editio, II c. 13, p. 188, line 5 to Prima Editio, II c. 14, p. 224, line 13, representing 36 pages of edited text. It’s unclear when, how, and why these pages were removed, although the folio numbering appears to be from the time of Thomas Phillips, so we can safely assume that they were removed at some point before he had the manuscript bound in its lovely leather binding. Commentary is a kind of transformative work, in which a writer expands on the thoughts of the original writer, expanding and explaining in order to create something new, but (hopefully) illuminating. 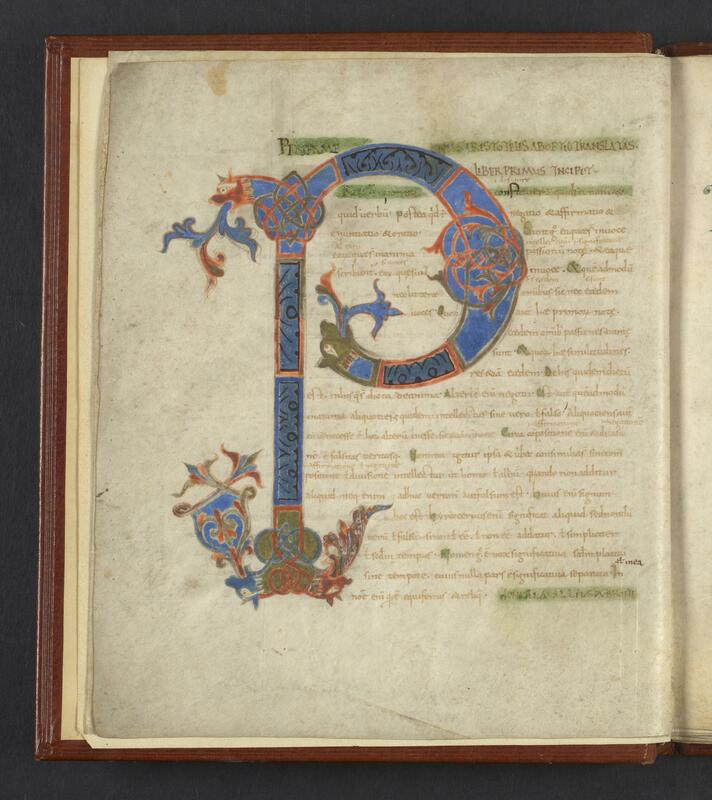 In LJS 101, then, we have a physical expression of a canon work followed by a transformation, an order that was planned by someone who cared enough to organize them that way. Fol. 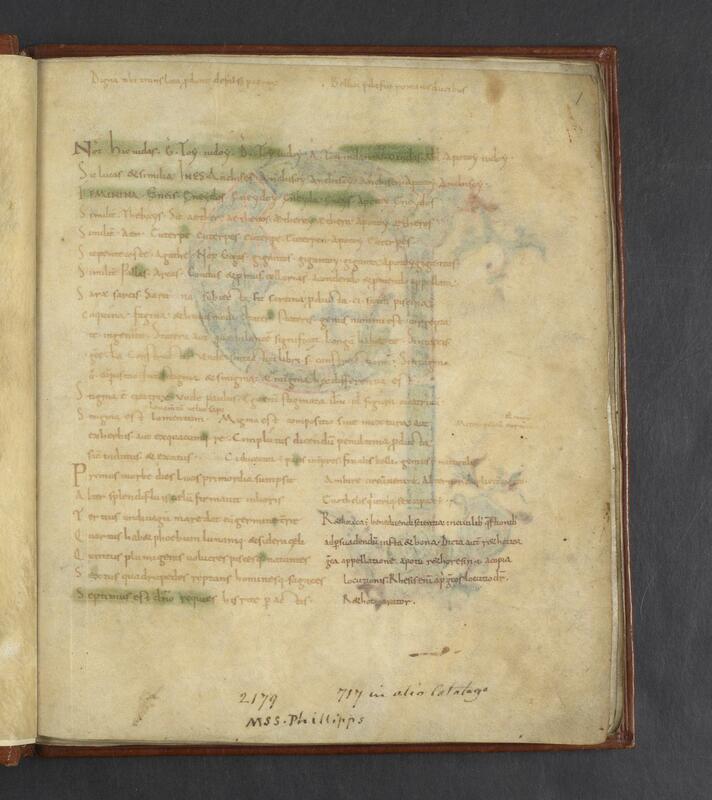 59v: Ending of Periermeniae, beginning of commentary by Haymo of Auxerre. 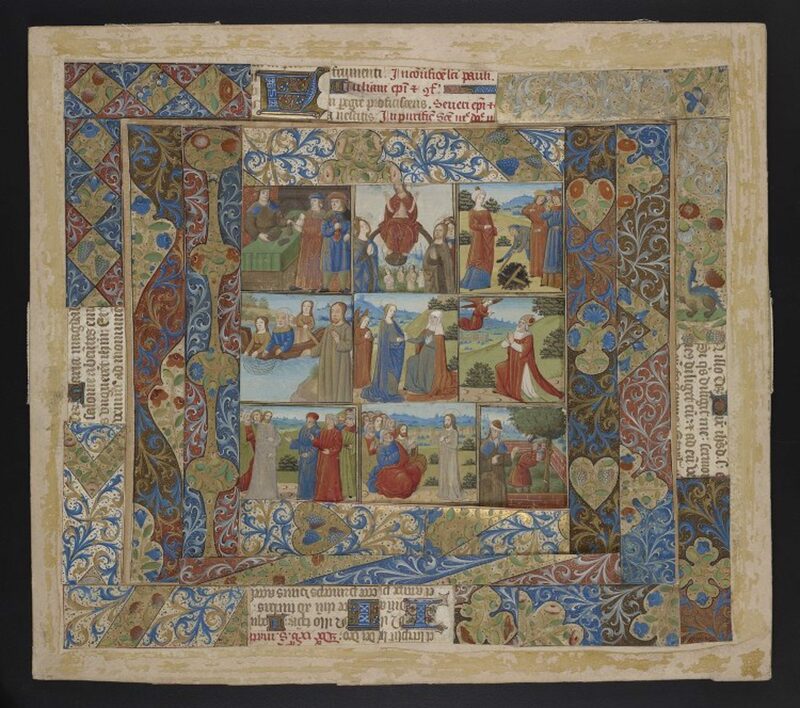 ,” from folio 1r – which is also on the topic of the seven days of Creation. 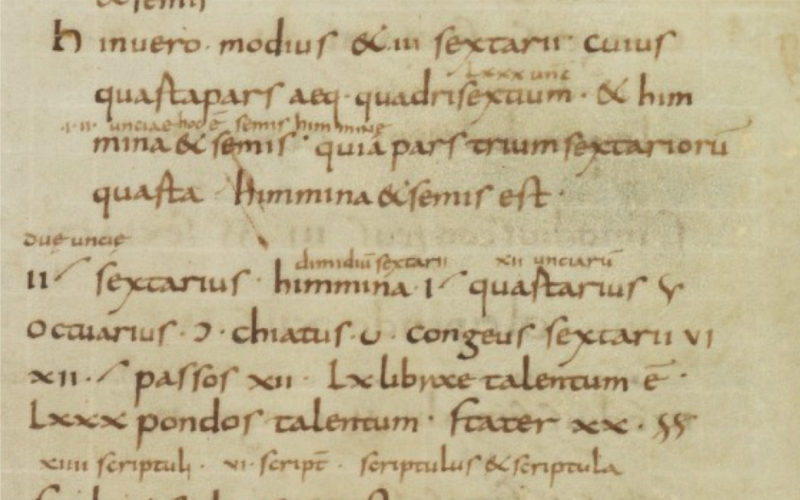 The next text in Quire eight is a sample letter of a monk to an abbot, on folio 60v. I want to thank Brother Thomas Sullivan from Conception Abbey for helping me with this text, which hasn’t been otherwise studied. This is the only section of the 12th century portion of the manuscript that is heavily annotated, the original letter being expanded by both interlinear and marginal glosses. The interlinear glosses expand the primary text into more intense or elaborate language, e.g., l. 8 inserts the Latin word valde (very). The marginal glosses are signaled by a system of thirteen different interpolative marks in the left margin and one in the right. The addressee appears to be one “Domno Luculemus,” and it is not clear if this is the name of an actual abbot, or an imagined character. The letter fits in with the medieval tradition of model letters and letter-writing guides, which is traditionally dated to the work of Alberic of Monte Cassino in the late 11th century and is well documented in the 12th century. Is this model letter another example of a transformative work? Because this particularly letter hasn’t been studied we can’t tell if it’s a version of an existing letter, or written with “characters” featured in other letters. If not, going back to our language of care, we can venture that since it appears on the verso side of a bifolium it was placed here for some reason understood by the scribe or scribes planning the layout. The Boethius text continues on Quire nine, folio 61r, and cuts off at the end of 62v. We finish up with folio 63r-64r, containing miscellaneous verses, definitions, and biblical commentary. 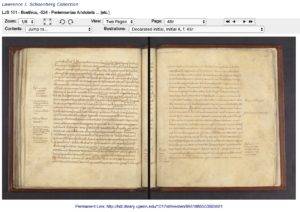 Oddly, folio 63v is a continuation of the sample letter on folio 60v. 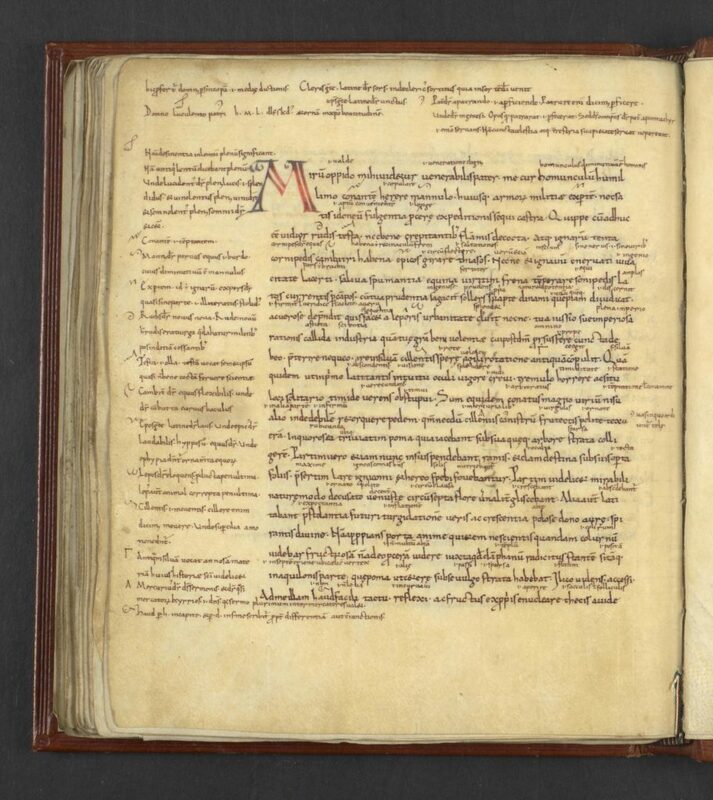 We’ll return to Quires eight and nine below, where I’ll say more about signs of lack of care in LJS 101, and describe how these two quires are currently misbound. Although LJS 101 is unique to Penn, it is not the only 9th century manuscript showing 12th century care. Bern, Burgerbibliothek, Cod. 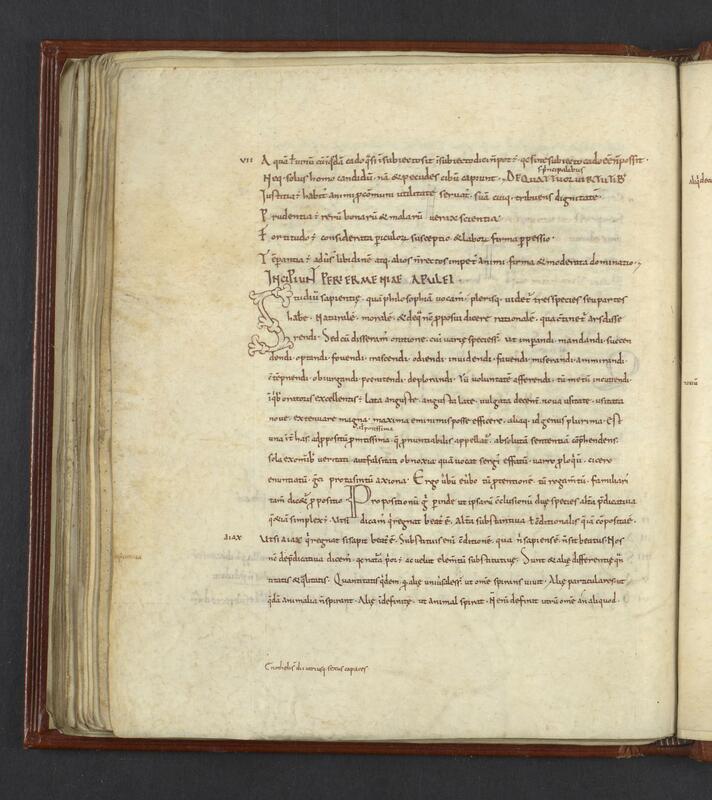 250, begins with a 9th century section (folios 1-11) describing a meeting between Einhard and Lupus of Ferrières, at the time that Einhard gave Lupus a book of arithmetic by Victorius of Aquitaine along with a now widely known model alphabet for Ancient Capitals. 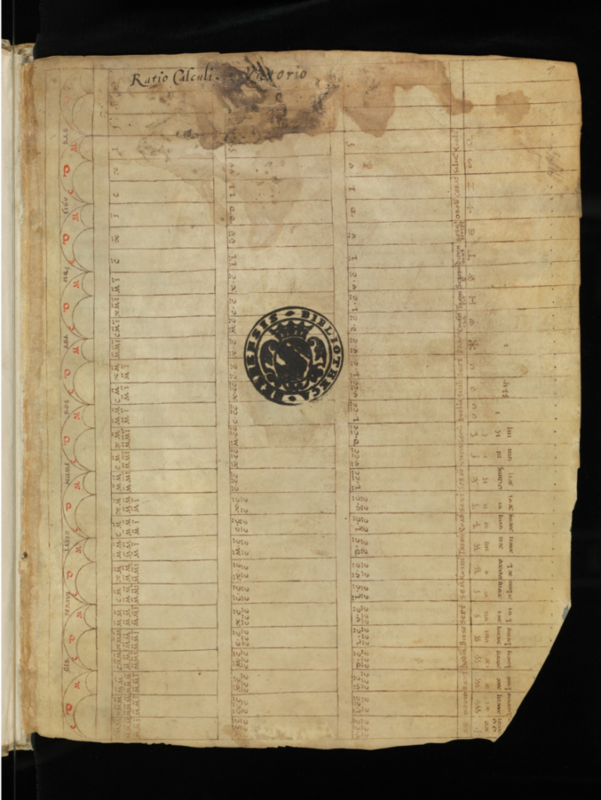 This is followed by a 12th century section, folios 12-18, including a commentary by Abbo of Fleury on the ‘computus’ (reckoning the date for Easter). 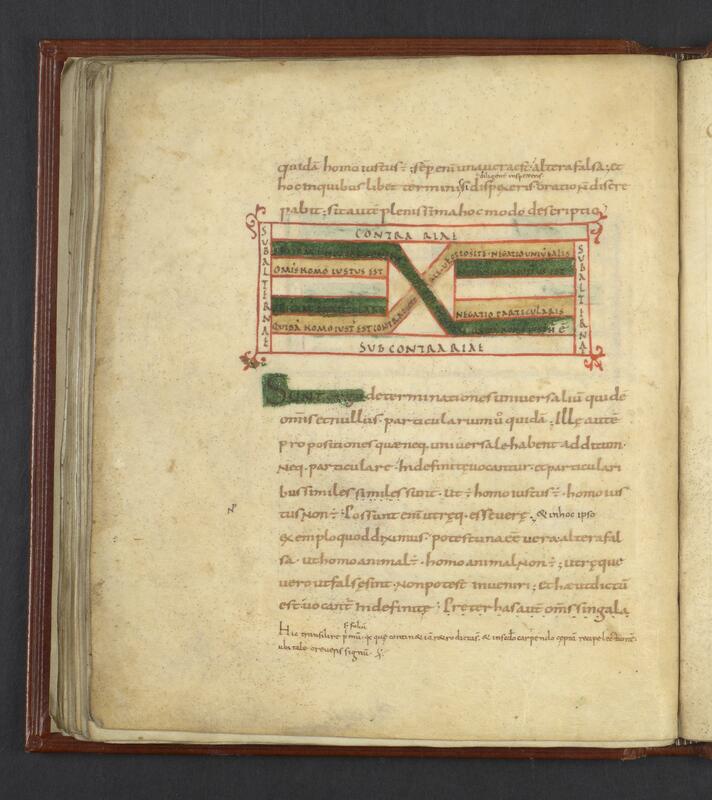 Note the green highlighting, which is similar to the green highlighting added to the diagrams in LJS 101. As in LJS 101, the 12th century scribe did not just add to the existing manuscript. They marked the 9th century text to bring it up to date, and to incorporate it into what is essentially a new object, and, arguably, a transformative work. 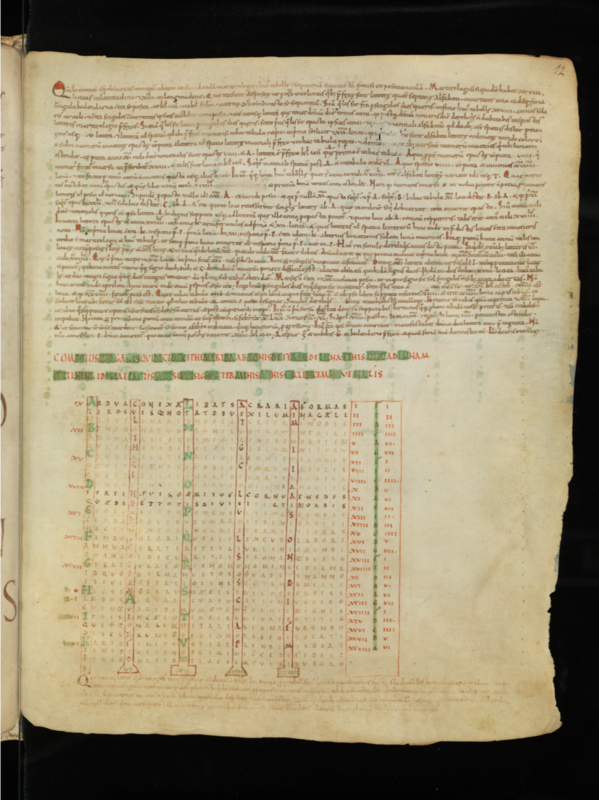 They added an abacus table to folio 1r, which was presumably left blank in the 9th century, and, as with LJS 101, they also added interlinear glosses and corrections. 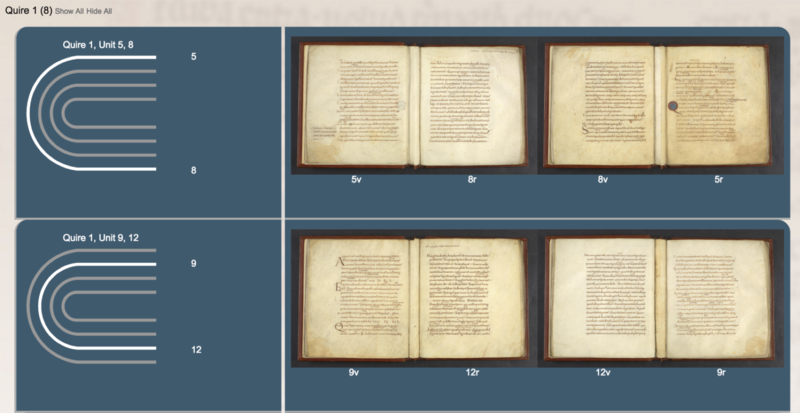 As with the transformation of LJS 101, these modifications show a certain amount of care, both for the older sections of the manuscript and for the new object. So we’ve walked through LJS 101 and looked at the transformative nature of the texts in the manuscript, and the physical object itself. 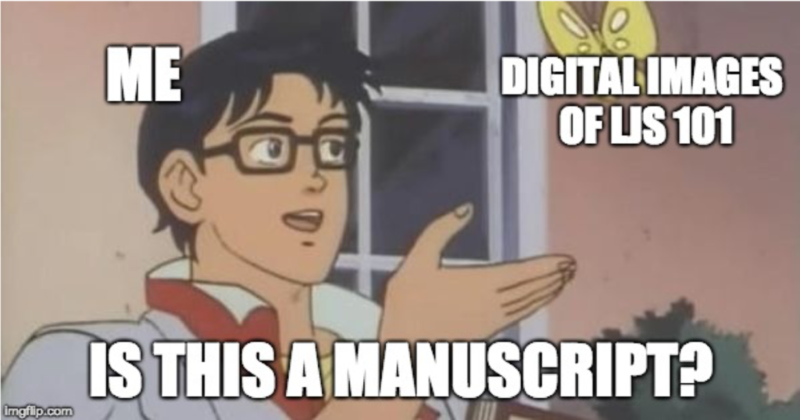 I’d like to spend the last portion of my talk looking at another transformative physical aspect of the manuscript and how this aspect may illustrate a lack of care, while at the same time exploring LJS 101’s digitization as another potential for transformative work around the manuscript. In addition to the missing quires between Quires six and seven and seven and eight, there are two quires in LJS 101 that have been misbound. In both cases it is clear that somehow bifolia were mixed up, likely during rebinding (whether during the last rebinding, under the ownership of Sir Thomas Phillips, or earlier, we don’t know) and care was not taken to ensure that the bifolia were put back together correctly with regard to the text contained on them. I can’t see any aesthetic reason for the quires to be rearranged as they are; antiquarians such as Matthew Parker frequently transformed the manuscripts in his ownership in ways that made them more attractive in his eyes, in various ways, but the changes made in LJS 101 appear to be accidental rather than purposeful. What was originally a quire of eight leaves was made into two quires of four leaves. The current Quire two consists of the the innermost bifolia of the original quire nested in the outermost bifolia, and the two internal bifolia from the original quire form the current Quire three. This is our first example of a lack of care. How did this happen, and why wasn’t this error, assuming it was an error, discovered before it was bound? 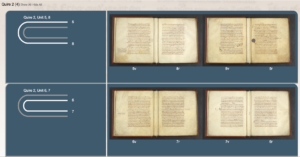 It might be hard to picture in your mind exactly what has happened here, so it might help to look at some transformative digital work using a project designed specifically to visualize the physical construction of manuscripts, VisColl. A couple of years ago a student in my Rare Book School class used VisColl to model both the current and previous structures of these leaves and generated diagrams to help us understand what exactly is happening here. Here is a diagram and bifolia visualization of the original structure of what are now folios 5 through 12. Using current numbering, the order of leaves should be 5-9-10-6-7-11-12-8. You can see in this diagram that 5 and 8 are conjoin and the outer bifolio, followed by 9-12, then 10-11, then 6-7. Looking at the numbering here you can see already how they were rearranged. But the next diagram shows the current structure, two four-leaf quires, with the middle bifolia grouped together and the outer and inner ones likewise. 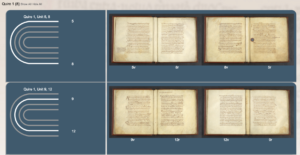 Viscoll, with its focus on modeling the physical construction of manuscripts and visualizing them in various ways, is a really good example of a system for building transformative works based on a medieval manuscript: It takes an existing character, expands on it, illuminates it, and in the process makes something new. The manuscript originally had a quire of 12 leaves. The innermost eight leaves were removed and placed before the outermost four leaves, giving us two new quires. As with the example of Quires two and three, there’s no clear explanation of why, and I am assuming this was an error. Transformative work in fandom is created by fans who take characters and situations from existing works and make new things with them. Transformative work differs from traditional scholarly work in that the focus is on affection. To quote Anna Wilson again, “It is a form of reception that is organized around feeling.” I don’t want to claim that 12th century scribes or Thomas Phillips loved the manuscript that we call LJS 101, but I do think it’s reasonable to suggest a language of care, and I think it’s a useful exercise to think about this manuscript and others within the theoretical frame of the transformative work. Doing this pushes the boundaries of current research in this area, which tends to focus on the relationship between fan fiction and earlier forms of textual reception. Moving beyond this, to consider a language of care when talking about manuscripts – bearers of text as well as physical expressions of their own history – and to the visualization of digitized manuscripts using new methods pushes traditional scholarship in new and exciting directions that also normalizes the affection we hold for the objects of our study. Malcolm Richardson, “The Ars dictaminis, the Formulary, and Medieval Epistolary Practice, Letter-Writing Manuals and Instruction from Antiquity to the Present, edited by Carol Poster and Linda C. Mitchell (University of South Carolina Press, 2007), pp. 52-66.